The Rebecca Bag, take two! I usually don't make a purchased pattern twice, if it is my own design I'll make it a lot, but normally with a purchased pattern I will make it once and then I move on. I think for me it is a way to learn techniques and then once I have learned from that project, it is time to move on. Well obviously this wasn't the case here. Case in point is the Rebecca Bag from the book, Bags the Modern Classics - Clutches, Hobos, Satchels & More by Sue Kim. My first time with the pattern was for Craft Book Month at Craft Buds, and you can see the finished bag and review HERE. After the blog hop, I had the bag hanging around in my house and my mom spotted it, she fiddled with it a bit and decided it would be the perfect style for her with a few modifications. She wanted more pockets, inside and out, and she wanted a shorter version, it didn't need to be as tall if she was going to use it as an everyday handbag. So I let her dig through all of my home dec fabrics (more than I care to admit) and she pulled out a mismatched stack of things she liked and gave me the job to surprise her with the final pick. Well little did she know that of the stack she picked, only one or two of the prints actually had enough yardage to make the bag, thus limiting the choices in the end. I think it worked out quite nicely though. The main fabric for the bag is a home dec from Joel Dewberry (a few years old) and the handles are a lovely Echino (also a few years old.) The interior is some random toile print that I had in my stash, whose origins are completely unknown, but works perfectly for a bag interior! I used a hot pink zipper and top-stitched everything with hot pink to accent the center of the flowers in the Joel Dewberry print. The top zipper was a neutral beige, so it would blend in, and is a "purse zipper" which has two toggles and is super thick and sturdy (I bought it at JoAnn fabrics.) I used a short zig-zag stitch to reinforce the handles where they separate from the bag body, I just wanted to have some extra stitching there, just making sure it was secure. I used a size 16 needle for the majority of the construction of this bag as there are many layers of home dec fabric and interfacing. For the final layers of stitching (the bias tape on the interior seams) I switched to a "denim needle" which would be equivalent to a size 18. It worked like a charm. Once I had finished the bag and it was already inside out, I decided to take a few pictures to really show you what the interior looks like. I added in the larger side pocket and another zip pocket for extra storage. You can see that all the layers are sewn together and then to finish the raw edges you attach bias tape to the unfinished seams. It seems like it would be hard, but it really isn't. I used Clover Wonder Clips (which are awesome by the way) to hold the bias tape on the seams and with that denim needle just stitched slowly and carefully around each side. It really isn't that hard, just takes a little patience. Some spots of the interior aren't perfect, and the stitching is a bit messy, mostly at the zipper ends and that short run of bias tape, but honestly what does it matter, it is the interior of the bag and barely visible. In conclusion, I love this pattern, and the book itself is filled with a ton of great projects. I think my mom loved the finished project (at least I hope so) and should be just big enough to hold all of her everyday essentials. The front divided pockets are just large enough to hold a cell phone, sunglasses, keys or anything you would want quick access to. The interior is just the right size to hold a magazine plus all of your normal purse goodies. The pattern really is a keeper! On a side note I normally take my bags outside to photograph them as I have more space and hanging opportunities outside. After I had taken the photos outside and then downloaded them to the computer I noticed that the bag really blended into the background, so I guess my colors were very nature inspired! LOL I ended up taking more photos on the white background so you could really "see" the bag. 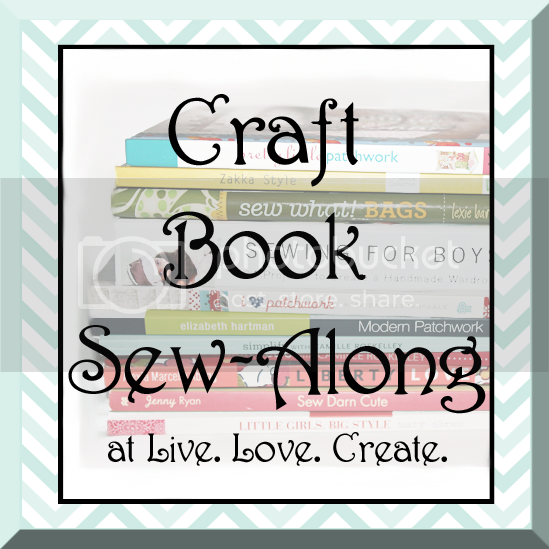 I am linking up to The Crafty Traveler over at Ellison Lane and the March Craft Book Sew-Along hosted by Live.Love.Create. This project was also my second finish in the first quarter of the 2014 Finish Along hosted by Katy at The Littlest Thistle. Very nice! Love the added tweaks to the pattern! The bag is great, very very nice. That hands! what a lovely bag! and it's so big, perfect in my eyes as I carry round the kitchen sink... it's great that you added pockets to the inside, you can never have enough pockets on a bag. I wish people would ask me to make bags as I love making them.